Advertising What are you doing after the trade shows? What are you doing after the trade shows? If you are like most trade show exhibitors you have talked to hundreds of visitors, handed out a lot of literature and accumulated a massive list of contacts. The many prospects that briefly stopped by your booth, also saw thousands of other products and talked to hundreds of exhibitors. Will they remember you, call you, or place an order? The answer is probably not. What you need is Trade Show Marketing! √ You only have Two Windows of Opportunity. Because trade shows are held in November and December, you have only a small window, before the winter holidays to make contact and get sales commitments. This time should be spent following up with “hot” prospects. This is the first window. Anything sent after December 15th, gets lost in the holiday season mailings and activities. Don’t waste your time and money. The second window comes right after the first of the year. An organized follow-up campaign should be designed, produced and poised to launch in January. Throughout this campaign, the sales staff continues to qualify and categorize leads, spending time on the greatest potential prospects. Additional sales support elements may be developed as the sales follow-up dictates. √ Coordinating your Advertising, Marketing, PR and Media Campaign is essential to a successful 2019. You have invested a lot of time and money exhibiting at Trade Shows, now maximize your return on your investment and let’s turn inquiries into sales. 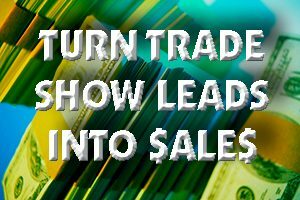 The Trade Show Follow-Up is a two-hour consultation at your location for a special fee of $300.00Contact me personally with any questions and to make an appointment. Tom Smisek is a Marketing Consultant based out of Orange County California. Orange County California, target marketing, Trade show collateral. Bookmark.